The funny thing is that Patricia and I weren’t planning on seeing BIG HERO 6 today. Our initial movie of choice was “Nightcrawler.” But in between the time we made that decision and when we actually got on the road to head for the movie theater a couple of things happened. Nothing major or life threatening, I assure you. But it was a couple of things that indeed were bummers and kinda put a hurt on the good mood we were in. So instead of “Nightcrawler” I suggested we go see BIG HERO 6 instead as I figured that a light-hearted, family friendly superhero movie would do much more to lighten our mood than a dark and nourish crime drama. Now I’m not going to say that we came out of the theater holding hands singing “A Whole New World” but I’d have to say we made a good choice in seeing BIG HERO 6. It’s bright, colorful and most of all, fun to watch. Yes, it does have some heavy moments of darkness but it makes sure to balance them with moments of triumph and joy. In the futuristic city of San Fransokyo, Hiro Hamada (Ryan Potter) is a 14 year old whose brain power is off the chart. He’s already graduated high school and makes money hustling suckers in underground robot fights, beating larger and fiercer robots with his rather goofy looking littler robot. Hiro’s older brother Tadashi (Daniel Henney) who is even more brilliant than Hiro, takes him to The Institute of Technology to show him how his intellect can be used in more productive ways. Professor Callaghan (James Cromwell) is Tadashi’s mentor and offers Hiro a challenge to come study at the Institute. Hiro also meets Tadashi’s friends: Fred (T.J. Miller) who plays the Institute’s mascot. GoGo Tomago (Jamie Chung) a hyperathletic adrenaline junkie whose specialty is electromagnetic energy that she’s applying to building better and faster bicycles. Wasabi (Damon Wayans, Jr.) is a laser expert who despite his hulking appearance is actually quite gentle and slightly on the neurotic side. Honey Lemon (Genesis Rodriguez) is a chemical genius in the tradition of great old school mad scientists. Hiro does indeed apply to the school, presenting his latest and greatest invention: microbots. They’re hordes of tiny robots that can link together to create anything the user can imagine, thanks to a mental link via a headband. Hiro is admitted to the Institute but his achievement is blackened by an unexpected tragedy. One that he chooses to deal with by secluding himself from Tadashi’s friends and his Aunt Cass (Maya Rudolph) Hiro’s interest in life is reawakened by two major events. The first is his discovering his brother’s greatest invention: Baymax (Scott Adsit) an inflatable healthcare robot who immediately adopts Hiro as his patient. The second event is Hiro learning that his microbots, which he had thought destroyed are being used by a mysterious man in a kabuki mask. The masked man has some sort of vendetta against Krei Tech, a technological company experimenting with teleportation. Hiro upgrades Baymax with battle armor and a memory chip that teaches Baymax karate and goes after the masked man. His first attempt fails miserably but after upgrading GoGo, Wasabi, Honey and Fred to give them superpowers based on their areas of technical expertise, the six of them become a superhero team determined to find out who the masked man is and why he’s bent on destroying Krei Tech. BIG HERO 6 is an origin story, yes, but I wasn’t bored because this is a team I’m not familiar with and characters I don’t know. Even though it’s based on a Marvel comic book (and so I suppose it can be considered part of the MCU) the characters in the movie differ greatly from the ones in the comic. And it’s not a terribly complicated origin story at that. I wish we had time to get to know more about the other characters but this movie is all about Hiro and Baymax and their relationship. Not that that’s a bad thing. Baymax is a wonderful character whose motivation stems from his being programmed to help others and if healing Hiro of his psychological wounds means that Baymax must allow himself to be weaponized into a high-flying, rocket-fist powered fighting machine, then that’s what he’ll do. But after going through all the trouble of creating such interesting and visually striking characters such as GoGo, Wasabi, Honey and Fred, I did want to see and know them better. We do get to find out something truly surprising about Fred that gets the biggest laugh in the movie and like any other Marvel movie, you’ve got to wait until after the end credits for it. But it’s worth it, trust me. The animation in BIG HERO 6 is nothing less than amazing. Maybe it’s because I don’t go out of my way to see a lot of computer generated animated movies and so I’m not jaded by the movement and detail. It’s still magical to me to simply look at. And it’s helped immensely by the kind of superhero story I love: the characters become superheroes because they honestly want to help people and make the world a better place. And if they can have some fun while doing it, why not? 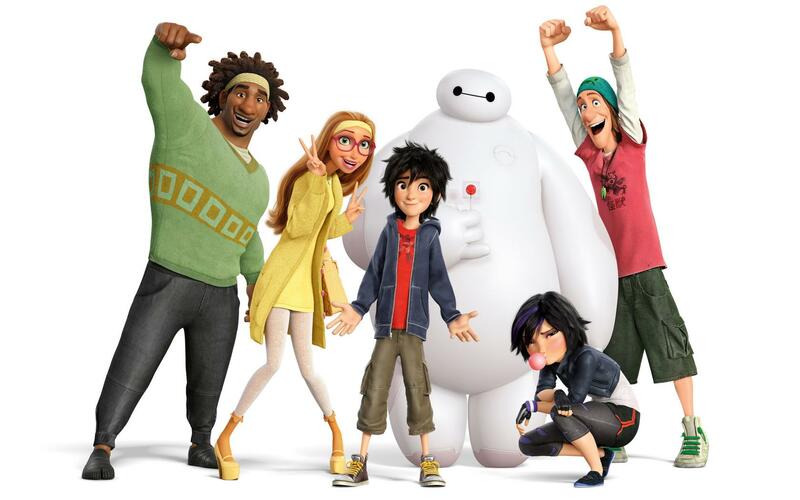 No, BIG HERO 6 is no “Guardians of The Galaxy,” the other big Marvel movie of 2014 and it wisely doesn’t try to be. It’s got its own brand of superhero fun. One well worth seeing. Enjoy. I agree. Big Hero 6 was a great movie. But I failed to stay long enough to catch the post-credit surprise. And yes, Nightcrawlers was a dark and nourish movie…I gained 3 pounds from watching it. I myself was waiting until the movie came to Netflix but I don’t regret seeing it in the movie theaters (and thanks to my Starpass points I even got to see it for free) and I’m glad I did. It’s not a movie that I would say you absolutely have to see in the theaters but if you do, you won’t regret it. And yes, I’m like you. I do enjoy watching anti-heroes who come loaded down with emotional and psychological baggage in stories of moral complexity. But i also enjoy a good ol’ fashioned fun superhero movie with characters who actually enjoy having superheroes and delight in having wild and crazy adventures.